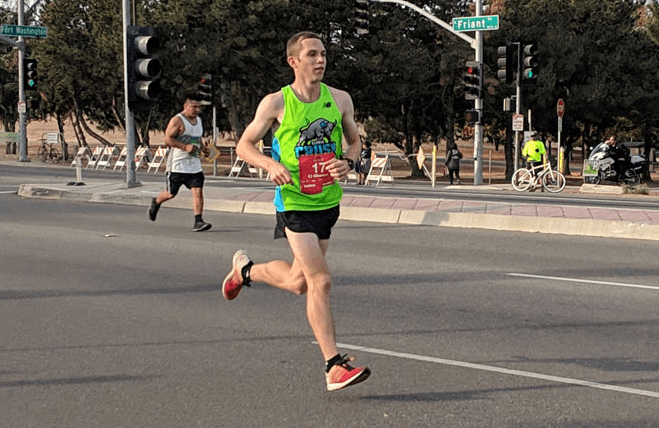 Clovis native CJ Albertson outran the competition at the 11th annual Two Cities Marathon over the weekend. The Buchanan High graduate and Clovis Community College cross country coach clocked in at two hours, 17 minutes and 40 seconds, winning the 26-mile race comfortably and setting a new record in the process. Albertson’s record-setting time was also good enough to earn him an invite to the 2020 U.S. Olympic Team Trials. For the 25-year-old Albertson, this feat comes on the heels of a stellar college career at Arizona State University. During his time with the Sun Devils from 2013-17, he became the school record holder in the indoor 5000m, cracked the Top-10 all-time school record in four different events, and qualified for the NCAA Track and Field National Championships. Looking back on the record-breaking performance, one person he’d like to give credit to is his father, who enrolled him in the sport at an early age. The next move for Albertson is getting his cross country team ready for the state championships coming up on Saturday, Nov. 17 at Woodward Park. “I get to coach a great group of athletes and I’m excited to see them perform well at state,” he said. Following the state meet, Albertson will spend the winter training before returning to campus in the spring for the start of track season.